Stagecoach Supertram has begun testing Sheffield’s new tram-train vehicles on the city’s light rail network. The Class 399 Citylink Tram Train vehicles, of which Supertram has seven, have now started dynamic testing on the network ahead of the start of passenger services this summer. The vehicles will initially support the existing fleet on the Supertram network, but in future three of the vehicles will operate dedicated tram-train services to Rotherham Central and Parkgate. To enable this, new infrastructure will need to be delivered. Network Rail has begun installing the OLE masts for a new 160-metre section of track, called the Tinsley Chord, which will link the Supertram network with the railway between Sheffield and Rotherham. The project also requires new stops at Meadowhall South and Rotherham Parkgate, and extended platforms at Rotherham Central station. Issues with this programme of works, specifically the complicated electrification infrastructure, has led to delays to the original timetable. After receiving government approval in 2012, passenger services were expected to begin in 2015. The infrastructure works are now scheduled to be completed in summer 2018. 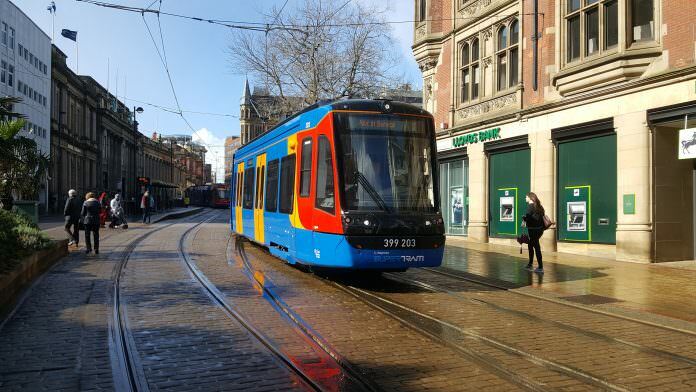 Stephen Edwards, South Yorkshire Passenger Transport Executive’s (SYPTE) executive director, said: “People in Sheffield will start seeing the new vehicles running “out of service” in-between scheduled trams. This important testing is making sure the vehicles and the existing Supertram system are working as they should. “Driver training will commence shortly and we aim to put the Citylink vehicles into service to supplement Supertram services from this summer.